The Peanut Butter Factory is not a theater company. It's a production company that basically provides the infrastructure for independent theater artists so that they can present their work, without being attached to a theater company (read more about it here). Sounds pretty cool to me, and with some familiar names on the list of Producing Associates (like Bradley Greenwald), I knew I had stumbled onto a good thing. 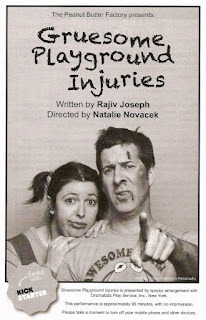 I was invited to attend their current production, Gruesome Playground Injuries, by the director, Natalie Novacek. I decided to check it out, expecting it to be a fun, light-hearted look at friendship and growing up. But it was so much more than that. It was unexpectedly poignant, heartfelt, moving, and really very sweet. Kayleen and Doug meet in their school nurse's office at the age of 8, he having "broken his face," and she having thrown up due to a "sensitive stomach." 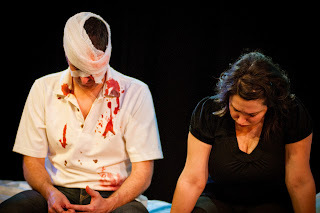 The play jumps forward and backward in time from there, visiting important moments in their relationship, which all seem to be marked by some injury or illness. Doug is accident prone, or more accurately he's one of those daredevil kids that constantly gets himself into situations where he gets hurt. Leeny (as only Doug calls her) has injuries and scars that are more internal. She takes out her life's anguish by cutting herself, eventually ending up in a mental hospital. Through it all, these two friends are there for each other, despite often going years without seeing each other. To say they love each other unconditionally doesn't even scratch the surface. They know each other as well as they know themselves, and love each other as an extension of themselves. If Doug and Kayleen had a theme song, it would be this from Bloody Bloody Andrew Jackson: "It's not blood, it's a metaphor for love. These aren't veins just the beating of my heart. This fever isn't real, it represents how I feel, my pain transformed into art." Unfortunately I've never had a 30-year friendship like this, but there is much in the story I can relate to. I'm the same age as these characters, so the timeline feels familiar (marked with music of the day). I also went to a Catholic grade school, and was traumatized when my best friend in first grade fell off the monkey bars during recess and smashed her face up. I can still see it clearly; gruesome playground injuries stay with you. And the scene in which Doug and Kayleen are 13 years old and at a school dance brought back that awful feeling in the pit of my stomach that only a 7th grade dance can give you. The story moves between timepoints seamlessly, and even if it were not printed in the program, the audience would know approximately where these characters are in their lives, based on accessories (eye patch, bow in the hair) and the way the actors inhabit their characters. 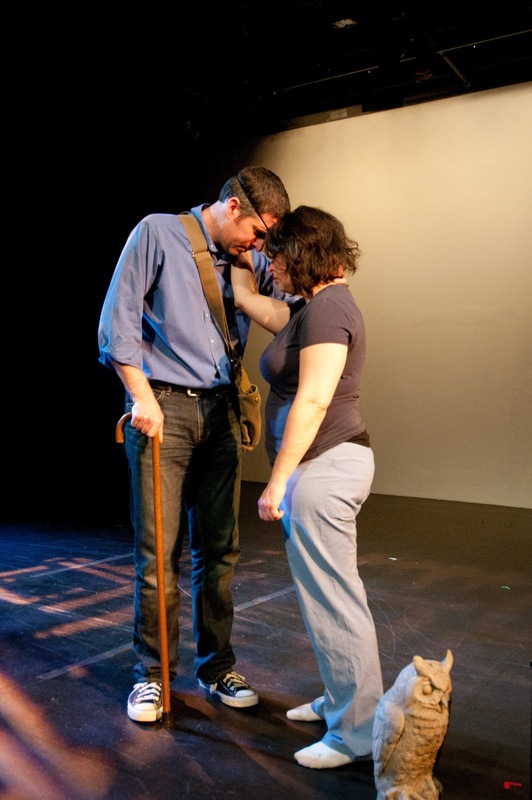 Adam Whisner and Leigha Horton (whom I saw in Minnesota Middle Finger at the Fringe last summer) bare their souls (and their bodies) on stage, and you really can't ask much more of an actor. They have a believable chemistry, and successfully portray the different ages from 8 to 38. Between scenes they change costumes and injuries on the side of the stage, in full view of the audience. They were chatting and laughing, sharing inside jokes, and I wasn't sure if it was in character or not. Either way it added to the feeling of familiarity between these two people. This is why I do this, friends. To go to an out of the way, under the radar theater with zero expectations, and be totally surprised and delighted and touched and moved. It doesn't get much better than that. That's why I love theater; it'll get you when and where you least expect it.﻿﻿ Only two performances remain of this hidden gem, catch it while you still can! And at just $10 a ticket, you won't find a better theater deal in town. *I received one free ticket to attend the show. But because I enjoyed it so much and think that the whole structure of it is pretty cool, I donated to their Kickstarter campaign, as you can do too if you wish!